Jared Miller (left) and Joe Dickey share a unique bond as grandson/grandfather and Veterans of the US Armed Forces. Miller said his grandfather’s military service has long been an inspiration to him. The 2009 South Range High School grad enlisted in the Army in 2011. The following year he was deployed to Kandahar, Afghanistan for nine months, mostly attached to the 82nd Airborne Division. He recounts stories of heavy combat action and nightly patrols keeping watch for his fellow soldiers. Miller served three years of active duty infantry and three years in the Reserves. Dickey enlisted in the Marines when he was just 16. It was 1945 and the United States was involved in conflict in both Europe and Hawaii. “I felt a duty I had to go into the service at that time,” he said. For Dickey, military service was a family business of sorts. His father served in World War I, Joe was in World War II, and three of his brothers also served. Dickey served from 1945-49, and while he never saw combat during his time delivering supplies by air to the Philippines, he said him and his fellow soldiers lived every day in fear. With Veterans Day upon us, Dickey appreciates the way most Americans are respectful of those who’ve served, but he wishes there were a greater emphasis on teaching military history in the classrooms. Miller echoes many of his grandfather’s sentiments, and added social media has given people the platform to express opinions – good and bad – about the military, and he acknowledges the many resources available today for Veterans returning from service. Dickey suggests parents take their kids to a parade or to visit a military cemetery as a way to pay tribute to military service. Miller added a more personal idea. “Go up to a Veteran, shake his hand, look him in the eyes and listen to his story,” he said. 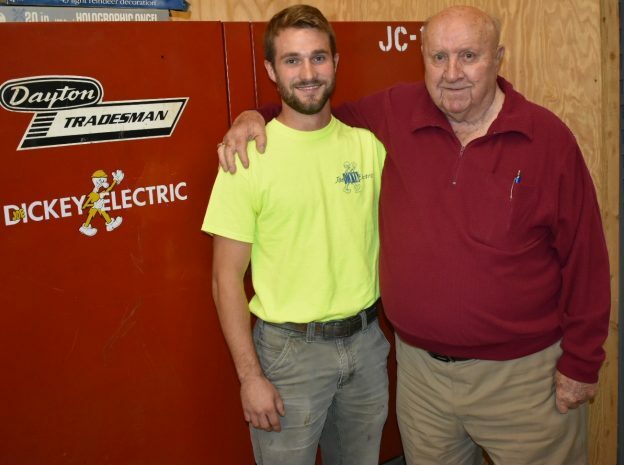 Dickey Electric is a member contractor of NECA-IBEW Electricians, an association of IBEW locals and signatory electrical contractors in the Mahoning Valley. NECA-IBEW Electricians supports many Veterans-related causes, from rebuilding VFW halls, to wiring Habitat for Humanity homes built for Veterans, to funding scholarships for YSU’s Veteran students and more.